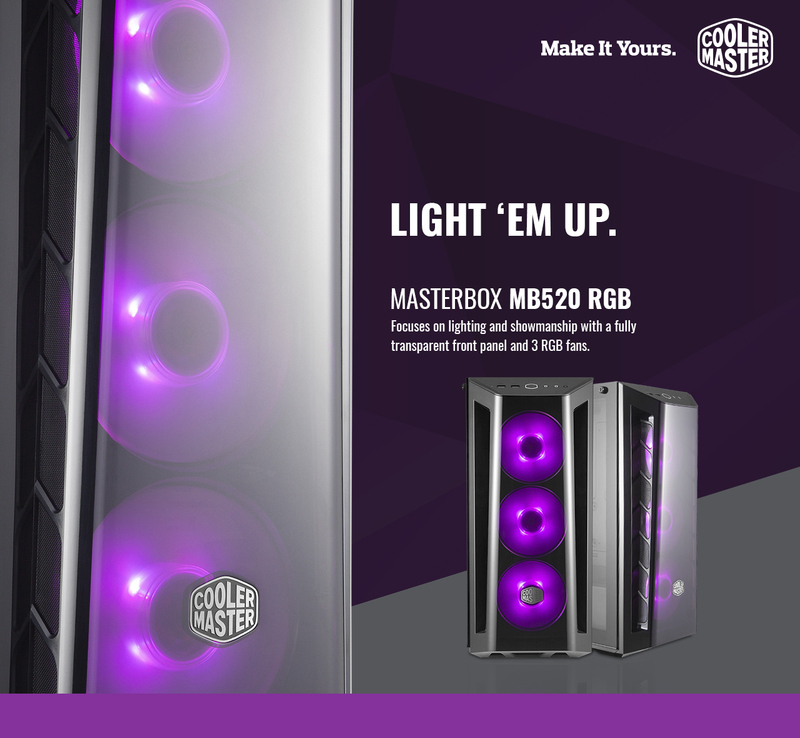 SINGAPORE – Cooler Master launches the MasterBox MB520 RGB. This version includes 3 pre-installed RGB fans, RGB lighting control, and a tempered-glass panel for a lighting system that is available as soon as the case is unboxed. The MasterBox MB520 RGB focuses on aesthetics and showmanship with a transparent, DarkMirror front panel for viewing the RGB fans. The aggressive intakes on each side of the front panel ensure airflow, with ventilation on the top panel for additional thermal support. DarkMirror Front Panel – Light up the room through the DarkMirror front panel. Aggressive Intakes – Large intakes on each side of the front panel let the system breathe easy. Edge-to-Edge Tempered Glass Side Panel – Showcase your build and system lighting effect through 4mm thickness tempered glass side panel. The side panel bracket hinges at an angle during removal, while two “captive” screws are held in place with rubber so they are not misplaced. Storage Trays & PSU Shroud – GFX cables can be routed directly through the PSU shroud rubber grommet. The storage trays, hidden in the PSU shroud, can mount an SSD and HDD simultaneously. Top Panel Ventilation – Filtered ventilation on the top panel has been added for thermal support. Out-of-the-box lighting is paired with a black-coated frame and PSU shroud to set the stage for the system configuration. To neatly display the system, an ample amount of space is provided for component clearance and to route cables. The SSD mounts, found behind the motherboard, are friction mounts. Without tools, four pegs are installed on the SSD and simply placed into the rubber holes, this will secure the SSD to keep it from moving even while the case is transported. The release of the MasterBox MB520 RGB will commence immediately, priced at SGD 99.